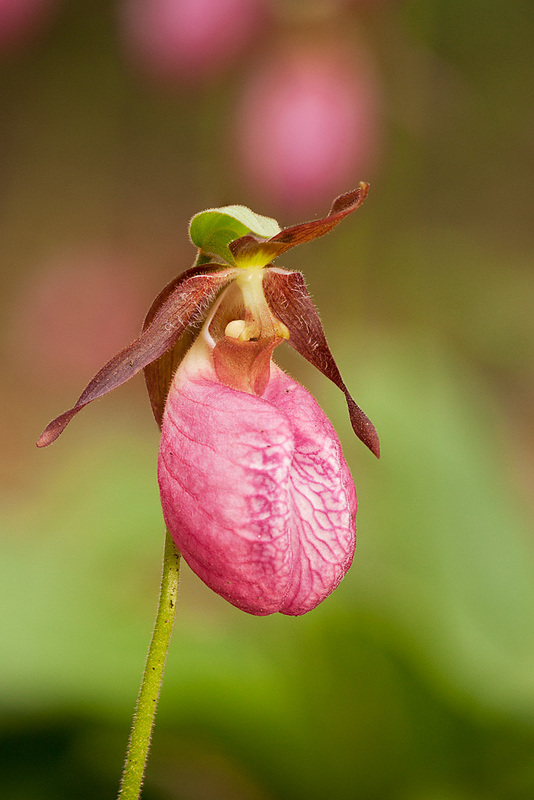 This spring was a spectacular year for the lady slippers in my back yard. There was one cluster of 20 flowers, with smaller plants of one to three flowers nearby. The flowers are located on the edge of the forest, next to a pile of cut logs with a rack of firewood behind it. Natural lighting can be difficult to deal with as the sun is low on the horizon sending shafts of light through the foliage of the trees. Occasionally overcast skies provided flat light that reduces or eliminates harsh shadows on the flowers. It was an opportunity to try several techniques capturing these beautiful flowers, and I went out early each morning while the air was cool and still. Once the sun starts warming the ground, air currents are created and even the slightest breeze results in significant movement in these large flowers on long stems. I often used a 160 LED lamp to illuminate a single flower. Most images are captured with a Sigma 150mm lens on a Canon 5D Mark II. I used tripod or beanbag for support and a wireless remote shutter release to avoid any movement during exposure. In addition to single captures of the scene, I made many captures with focus stacking in mind as well sets of images (a series of the same image at all f-stops) for use in teaching programs. I also made a few images using a 50mm f/1.8 on the Canon 7D. The first set of images were made by selectively focusing on different parts of the flower, then merging them into one image file using Helicon Focus stacking software. Last year I had done quite a lot of image taking and analysis in an attempt to understand where focus stacking works and where it doesn’t. The extensive blog posts totaled 30 pages. Helicon Focus recently had an update and added a new stacking algorithm which I used on a trial basis. I was satisfied that it performed well on these image and purchased a one-year license ($30) for the Helicon Focus Lite. I plan to reprocess the images sets I took last year to see if the new algorithm solve some of the problems I described in my posts last year. The reason for using a stacking program is to benefit from an extended depth of field at the subject while shooting at a large aperture to retain the soft out-of-focus (OOF) background. The images are labeled as a single exposure or number of images stacked, and the f-stop used. To better see the effect of aperture on depth of field, images of a scene were captured at a various f-stops, and one image was constructed of several captures stacked together. The higher the f-stop (smaller aperture), the greater the definition in the background structure. As the aperture is opened, the depth of field lessens and the background becomes a pleasant, soft blur. Unfortunately, the wide aperture doesn’t capture much of the flower in sharp detail, which is where focus stacking can be of benefit. Care must be taken in capturing images for focus stacking to ensure sufficient overlap in the regions of sharpness. The technique doesn’t always work cleanly, and in some cases there are artifacts that require a lot of editing to correct, if they can be corrected at all. My wife Chris and I were able to get to Cape May this year, principally to attend a 3-day bird migration workshop conducted by the Cape May Bird Observatory. We’ve been going to Cape May every year for the last 20 years or so, except for the last three years. Bird photography here is generally not easy given the vagaries of weather, which affect when the birds migrate through. This year much of the warbler migration had passed thought a few weeks early. On top of that, the trees had leafed out considerably, making finding birds difficult, and making photography even more difficult. I had more luck this year with osprey and other flying birds. However, there seemed to be an abundance of Prairie Warblers in the area, and I did get a few good images. I also did a bit of bird flight photography in preparation of a presentation, Birds in Motion, I made at the Photographic Society of Rhode Island. I was very pleased that I was able to capture a Bluebird in flight with an insect in its beak. He was bringing it to his chicks in a nest box. My friend and award winning photogrpher Greg Basco has posted an interview he conducted with me for his website, Deep Green Photography. The interview includes some thoughtful questions on how I view my photogrpahy and the tools and techniques I use to make my images. Unfortunately, Greg has re-architected his blog and the interview is no longer available. One way I share my photography is to make showcase presentations; groups of slides set to music. I have two shows completed that I have presented at camera clubs and at the NECCC annual conference. I was asked to show one at the Cortland Place assisted living facility in Greenville, RI for a change of pace from their normal entertainment activities. The show “Favorite Places, Favorite Images” was well attended and well received. One resident, a retired first-grade teacher, was so moved by the show she got out of bed at midnight to write this poem. We say lovely scenes – not a car, house or steeple. Just flowers, birds and faraway tiny people. In the yard we saw Indian Pipes and other fungi. And butterflies whose colors struck the eye. And striking deserts – eons old. Hills and Valleys made a scene. I even remember a lovely ravine. Ancient trees so gangly and stark. How many years since they’d had bark? There were streams and gulleys and a water fall. So much beauty – can’t remember it all. I recall a desert stretching forever. I saw a double rainbow with all six shades. Glowing through the mist – a colorful sight it made. Then there were creatures, some of them small. Little bugs and snakes, can’t recall all. Next came the lion – mouth open to roar. Great fun to look at – not to adore! Believe me when I say, it doesn’t ‘geys’ alone! Clouds and sunsets were there for us. We got them free – no need to fuss. There only one phrase – they did us enthrall. Or three or four – possibly more. It was a marvelous, splendid afternoon. Will you please, I beg you, come back soon. To further understand focus stacking and to compare the good, bad and ugly of Photoshop auto-merge, Helicon Focus and potentially other focus stacking software, I set out to capture sets of images to challenge the technique. I also spent a lot of time attempting to reduce or eliminate the haloing problem on the rattlesnake orchid image stacks. I tried dividing the image sets into smaller groups for stacking then combining the stacked images into another stack. That didn’t improve the image at all. I also tried reversing the order of the images in the stack, which did not improve the image either. One approach that salvaged the set of image captures was to change the objective for that image; merge the captures of the blossoms at the front of the plant instead of trying to have sharp details from front to back of the orchid. The image on the left is a section of the nine slice stack and the one on the right is a section of the stack of the five slices at the front of the subject. All of the background objects (the stem and farthest blossoms) are a softly rendered out-of-focus. After photographing flowers, mushrooms, spiders and water drops, I now had 30 sets of image captures made to support my experiments with focus stacking. The first thing I did was to process the same sets of image captures in Helicon Focus software and Photoshop. In many cases one did a better job of merging the slices than the other, and occasionally neither product was able to cope with the elements in the composition. Helicon Focus software did much better at combining the in-focus background with the in-focus foreground objects of my first image stack, the orchid from Costa Rica. However, that’s not to say that all the Helicon Focus composite images were error free. In fact, new types of errors occurred. 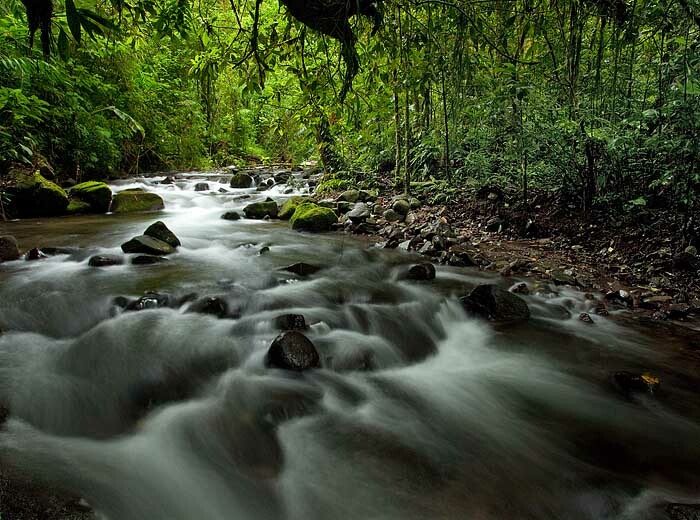 In the Costa Rica orchid image, there were no noticeable halos or misalignments, and the composite images looked good with none of the pinched paper or edge overlap effects displayed in the image processed in Photoshop. One thing to keep in mind is that this image has a sharp foreground object, an out-of-focus background, and the images were taken with the camera and subject motionless. Also, Helicon Focus provides two processing methods and encourages the use of both to choose the best result. The image below is the result of Method B. For convenience, I’ll compare a few of the many focus stacks I made from the subjects I photographed. The comparison of Photoshop and Helicon Focus image stacks is extensive and can be found HERE. 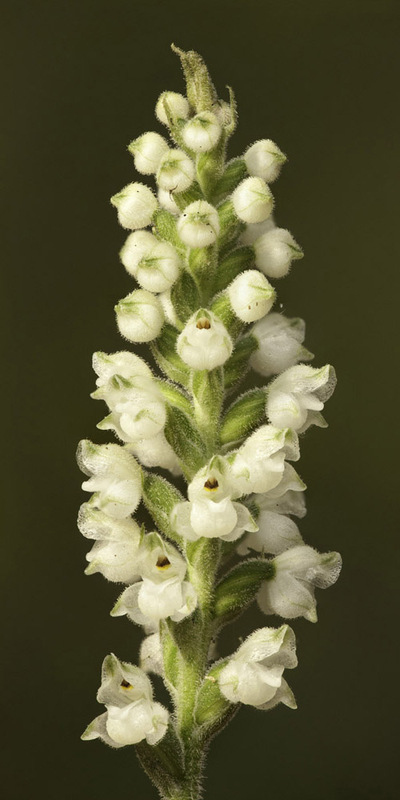 In the photograph of the rattlesnake orchid plant, the halo effects along the stem and the leaves were greatly reduced in Helicon Focus, but other anomalies appeared. At first glance it appears that Photoshop includes more area in the composite image. However, if the image were cropped to eliminate the mismatch along the edges of the image, it would be very similar to the Helicon Focus images. It is important to try both methods in Helicon Focus; Method A produced a nice soft background and Method B resulted in a mottled background, so method A was clearly the choice for this images set. There is a pine needle near the base of the large leaf at the back of the plant. In the Photoshop images it looks normal, but in the Helicon Focus image it appears in pieces. On review of the separate slices, I discovered I had absentmindedly removed the pine needle half way through the capture of the image slices. It hadn’t dawned on me to start the image captures from the start. Photoshop ignored the fact that all the images did not contain the pine needle and masked the layers to include the whole pine needle in the image. To remove it by changing the masks of the separate layers in Photoshop might be complicated, but Helicon Focus includes a retouching tool that made short work of removing the pine needle from the final image. Another strange error occurs along the lower edge of the image which is very soft in an odd sort of way. Image 1 below is a corner of the method A result above, and image 2 is after retouching using the Helicon Focus retouching tool. It took less than a minute to make the changes. The mushroom photo sets provided a challenge for both the products. In the most difficult set, two clusters of mushrooms spaced an inch or two apart are in the composition and part of the rear cluster is close to the background. This arrangement provided the opportunity to investigate where the halo artifact appears. The 25 captures were made at f/14. Unfortunately I did not take a similar set at a larger aperture for comparison. Method A worked best of the Helicon Focus options. The entire image is shown at the left and three areas are identified for detailed examination. 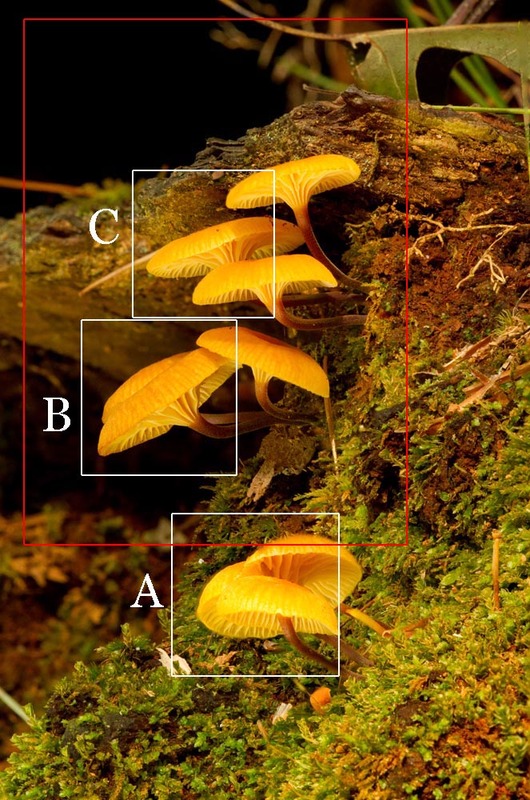 The red outline indicates the composition of the second mushroom image described. The cluster of mushrooms at the bottom of the composition (detail A) was a challenge for both Helicon Focus and Photoshop. The three mushroom caps overlap and the moss in the background is rendered in focus since the focus slices extend to include the other cluster of mushrooms. Both have a halo around the edge of the mushrooms that meet the background moss. 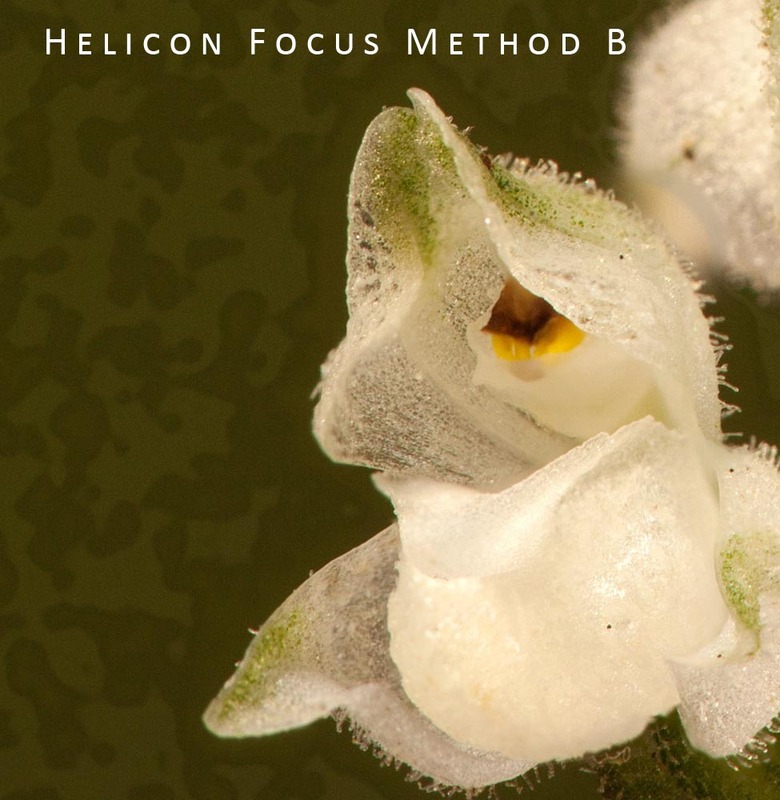 Helicon Focus (both methods) has less of a halo, but would require some serious editing to use as a large print. Detail B below shows Photoshop provides a very good composite image of the overlapping mushrooms with nice detail and good separation from the out-of-focus background. Method A of Helicon Focus shows a halo at the top of the mushroom cap, and the detail is lacking due to the somewhat muddy looking colors of the mushroom cap. Detail C below is a crop that includes parts of three mushroom caps near the background. Photoshop again performed well with good merging of the detail in the mushroom caps, no haloing, and good selection of the background information. 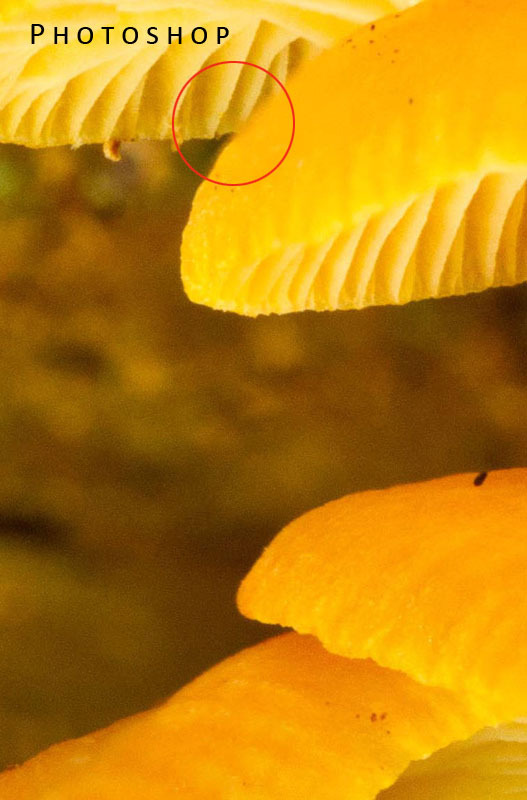 The Helicon Focus stack has significant problems rendering detail in the mushrooms and the background. Reviewing the twelve captures in this stack reveals that one or two of the captures had some additional brightness, probably due to a break in the clouds at the time of the captures. Helicon Focus did not do well with the first mushroom focus stack but performed much better on other mushroom images taken on the same day under similar conditions. The camera was moved closer to capture only the top cluster of mushrooms. Although the aperture remained set at f/14, moving closer reduced the depth of field of each capture. Helicon Focus Method A (below) did the best at assembling the composite images with very few anomalies, and the background was a nice soft rendering. Photoshop did very well also but had a few areas (red circle) where the layer selected was not the optimum sharpness. The locations this happened in this image would have been fairly simple to fix by adding the image with the best detail as a layer to the composite, and mask in the proper sections. Helicon Focus Method B had the worst result with strange green bands and a background that was nearly psychedelic. Another instance where the use of focus stacking has great benefit for me is when I want a foreground subject sharp, and the background softly out-of-focus, as in the example of the spider and web. I captured six sets of images and Helicon Focus had a difficult time with all of them due to the movement in the spider web, and exacerbated by variations in the lighting. Photoshop aligned and merged the four captures in this stack, and the only anomaly in the image is circled above. It is a section of out-of-focus web that shows larger than the web in focus and somehow gets chosen as being sharpest. This was easily corrected by erasing the section of the out-of-focus web from two focus slices then merging. The misalignment in Helicon Focus was partially solved by aligning the images in the stack with Photoshop, saving each layer as a new image file, then combining them in Helicon Focus. This process worked well with some of the rattlesnake orchid images, and while Helicon Focus assembled the spider correctly (image not shown), it still had trouble with the spider web in some locations. At first I was mystified by the haloing effect, but since Photoshop and Helicon Focus were exhibiting the same effect in the same places on the image, it was likely not related to the software processing. In fact it is an optical issue. To prove this to myself I set up an experiment with a subject that could be arranged so that one part of the subject overlapped a more distant part. I chose a branch of berries from a tree growing in my yard. To avoid some of the problems associated with subject movement or changes in brightness, I set up two analog lights indoors, placed the branch of berries in a clamp, and set the camera on a tripod. I also used the Helicon Remote software to control the collection of the focus slices. The closest and farthest points of focus are set in the software, which calculates how many focus steps can be made between the two settings. The user has a choice to reduce the number of captures, but I collected the maximum; I could always eliminate slices from the stack. Capturing the images in this way eliminated some of the sensitivities of the Helicon Focus software which are that the slices should be roughly equal in steps, should be the same brightness, and should be aligned perfectly. When a subject is out-of-focus it appears as an ill-defined projection of the subject. When the focus point is on a background subject, in this case the stem, the berry is out-of-focus and extends beyond the in-focus berry. When the focus is on the berry, the stem is out-of focus. 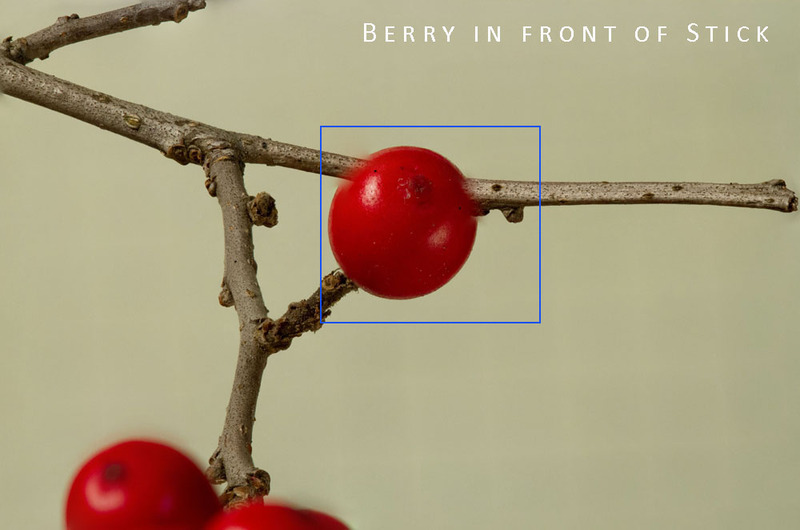 The area adjacent to the edge of the berry near the stem is impossible to capture in sharp focus, or at least without the out-of-focus foreground image overlapping. The images below were captured using the Helicon Remote acquisition control software with the camera set to an aperture of f8. Neither Helicon Focus nor Photoshop, or any other focus stacking software, have a chance of correctly capturing and merging images of this type due to the optical phenomenon of the out-of-focus foreground subject making it impossible to get in-focus background subjects adjacent to the foreground subject. The examples below are crops (blue outline) of the full frame image above. The Helicon Focus and Photoshop composite images all fail to render the berry complete, although the Photoshop rendition is clearly closest to complete. Both methods in Helicon Focus appear to have difficulty in selecting the berry parts early in the process select slices that are more out-of-focus than optimum. They also exhibit significant halo around the berry and below the stem. The fourth image is a copy of the Photoshop image layered with two of the slices that include portions of the berry near the edge and the adjacent one toward the front. The image requires additional editing on and near the stick, likely layer masks, to completely correct the red color halo on the stick. Similar editing can be done on the Helicon Focus images using the included Retouching tool although it would most likely require some work using the masking capabilities in Photoshop. There may also be a benefit to shooting at smaller apertures, and more exploration in that direction is needed. The images below are Helicon Focus processed, one set captured at f/2.8 and the other at f/8. The image comprising slices taken at f/8 are clearly better as expected; the out-of-focus blur should be smaller at a smaller aperture. For this composition editing the f/8 image would be manageable as the only difficult areas are between the berry and the stick. 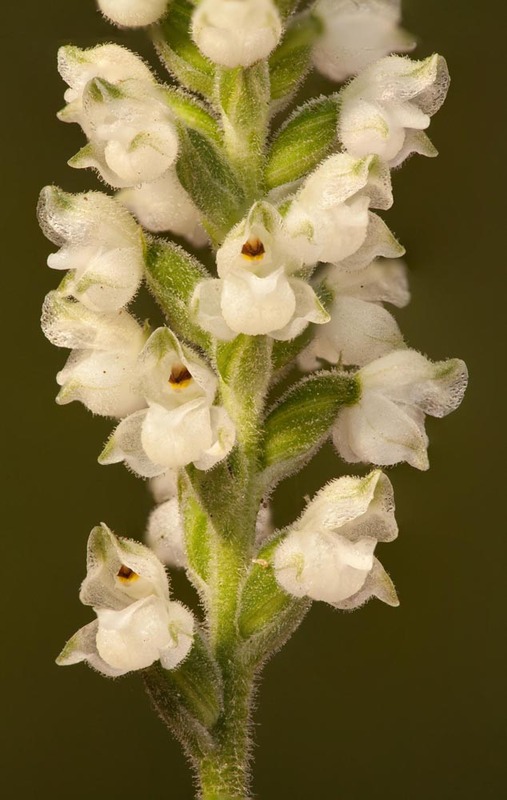 For a more complex image, such as the rattlesnake orchid, editing may be very extensive or even impossible. Photoshop and Helicon Focus both have their strengths and weaknesses based on my observations. Shooting for focus stacking requires planning, just as photographing panoramas and multiple images for High Dynamic Range processing require planning. The images must be captured with the processing method in mind. For focus stacking, the best results will be had when the camera is on a tripod, the subject does not move, and the lighting is constant. This pretty much defines an indoor setting. However, much of nature is outdoors, where the light can be variable and the subject may move even though the camera is rock solid. While Helicon Focus generally does well at putting the image stacks together, added benefits are the Helicon Remote control of the image capture process and a sophisticated retouching tool. Photoshop provides the ability to align images in the stack that might be offset from others prior to stacking and can handle brightness variations between images in the stack, and I belive I will have some uses for this technique. PROs: Useful tool to extend range of sharpness in an image. —— — Useful to isolate subject and allow background to be rendered as soft focus. CONs: May not be effective in cases where in-focus foreground objects overlap in-focus background objects. PROs: Auto-Align corrects misalignments of captures prior to merging. —- — Auto-Merge handles variations in color and brightness in captures. CONs: Manual acquisition of image slices can leave gaps. —— — Retouching final image by correcting mask layers can be tedious. PROs: Some control over merging process. — —- Two processes provided with adjustments. —- —- Sophisticated retouching tool. —– — Helicon Remote control of camera ensures sufficient number of slices captured. CONs: Does not tolerate misaligned images in the stack. —- —- Does not tolerate variation of brightness between images in the stack. I haven’t yet decided if I will purchase Helicon Focus, but I will certainly continue to experiment with the free trial, which after 30 days limits the size of images produced and includes some marketing information on the stacked image. I’ll try additional images of flowers as I’d like to use the technique in my outdoor macro work, and will come up with methods to control illumination and subject movement outdoors. As I experimented with capture and processing of images for focus stacking, I discovered some recurring anomalies that I had never heard about in any presentation or article that describe the technique. This is most disappointing if you rely on reviews and articles for product information, in addition to the advertisements, when making a purchase decision. When capturing the images for a focus stacking operation, the focus point of the lens is set on various parts of the subject. This can be done in one of two ways; by adjusting the focus distance while keeping the camera position fixed, or by adjusting the camera position while keeping the focus distance fixed. One image presented three anomalies all related to the varying image magnification as a result of changing the focus distance. The focus slices taken of the orchid image below were accomplished by changing the focus distance with the camera in a fixed position on a tripod. While the image layers all have the same pixel dimensions, it can be readily seen that the image content is different due to the slight difference in field of view that occurs from changing the focus distance but leaving the distance from the camera to the subject unchanged. 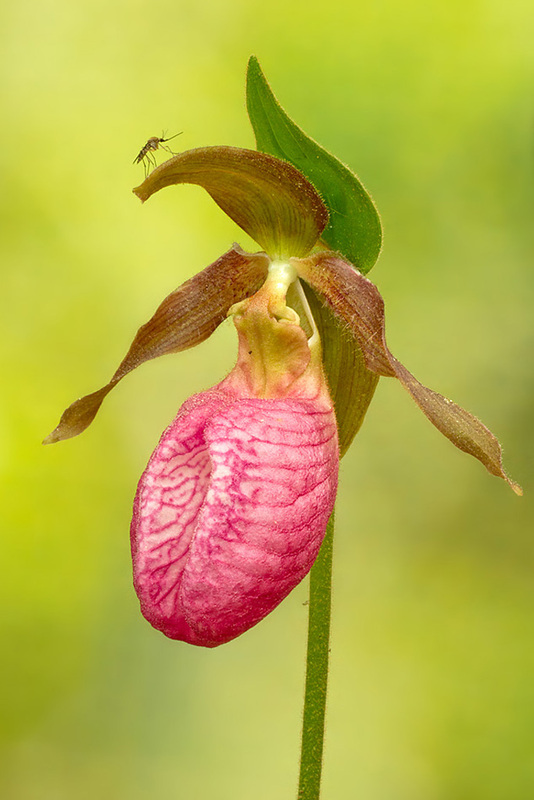 The image of the orchid shows the difference in field of view of the closest and farthest focus of the six images after the images have been aligned by Photoshop. Photoshop’s auto-align feature will change the dimensions of the images so that the image content is aligned. Small variations will be ignored and most of the image elements will be aligned. Keep in mind that the camera position was not changed during the series of images, but only the point in the image on which focus was set. In the above example the center image is the closest point of focus as evidenced by the near tip of the orchid’s sepal in focus. Once the captures were aligned and merged, several anomalies were evident. One surprise was several series of black dots i n the image. It took a while to realize these were out-of-focus insects in the background which were in a different location for each image capture in the stack. If they had been stationary objects in the background, they would have presented as one dot when the layers were aligned. I found the easiest way to eliminate this problem was to use the Spot Removal tool in Lightroom on the six image captures before merging them together. Another phenomenon was what looked like pinched paper along the edges of the merged image. I found that these are transitions between the edges of one image with that of another and larger image. As noted earlier the software changes the size of the image in the stack so that elements of the image are aligned causing an overlap of the edges of one layer with the next layer; the software must occasionally sense this as a sharp feature and preserves it in the composite image. This is easily fixed in the final image with cloning if it occurs, or by cropping if it is prevalent and fixing will take too much effort. Also, with the exception of this image stack the phenomenon rarely occurred on other images stacks that I made. In any case, with Photoshop merged images, edge cropping is often required. The effect along the edges of a stacked image usually present as bands of non-overlapping areas of the farthest slices. These are easily crop ped from the composite image. Another edge effect is the transition of an element at the edge of a smaller layer with the same item that extends into a larger layer but at a different focus, which is also easily rectified by cropping. For this orchid I opted to layer in the whole leaf by merging the layers of the stack, added one of the images in the stack of which the leaf looked the best, and used a mask to blend the leaf to the stacked image. With the exception of the leaf in the lower left corner of the image, the edges consisted of distant out-of-focus background and no bands were evident, which is the reason for cloning in the full leaf in the corner. Having waited all spring, my first images of the rattlesnake orchid were of the flower stem rising from the leaves, whose pattern gives the plant its name. The first image is a single exposure at f/22 and you can see that although the front leaves and the stem are in focus, the background leaves are out-of-focus. The second image is a 13 image stack taken at f/8 and you can see the improvement of sharpness from the front leaf to the back edge of the rear leaf. In addition, f/8 allows the background forest floor to remain somewhat out-of-focus, certainly enough to make for a more pleasing background. The last two images are the first and last images in the stack and it is obvious by looking at the edges of the leaves near the sides of the image, that a significant shift in magnification as the lens is focused. Not a problem though, as Photoshop clearly accommodates this in the auto-align algorithms. However, it may be a good practice to check the composition at both the closest and farthest focus points to ensure that all important subject elements are in the frame before starting the image capture process. The distance from the front of leaf tip to the distant leaf tip in this example was 3.5 inches. Now all I needed to do was wait for the blossoms to appear and I would be all set to photograph this interesting orchid. The images above were captured at the end of June, and I waited until early August for the orchid to develop so that some blossoms would be fully deployed. The dimensions of the orchid’s leaf structure remained the same as the previous images; however, the stem had grown to be nine inches tall with the flower head at the top of the stem being two inches in height. Each fully deployed orchid blossom was .25 inches tall. If I captured the images to include the leaves as well as the blossoms, the details of the orchid would be minimized. My interest being in the structure of the orchid blossoms, I opted to photograph about the top two inches of the flower. Unless otherwise noted, all the images in this article were taken with a 5D Mark II and Sigma 150mm f/2.8 macro lens. The camera and lens were cradled on a beanbag on the ground, and light was provided on the flower by a 160-LED light panel on a small stand with natural light on the background. 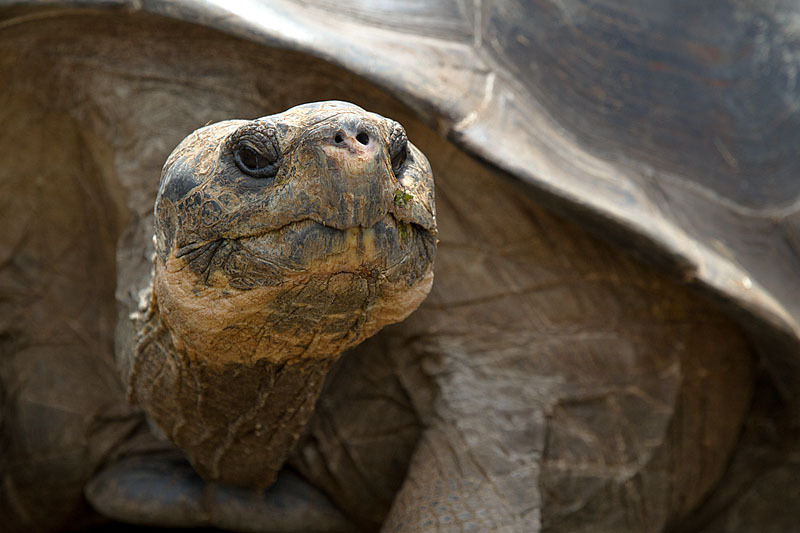 All of the images in this article have no sharpening applied to the composite images so that the effects of focus stacking can be better observed. My first set of image slices were taken at f/8 at 1/25th second exposure. I made five captures starting with the focus point on the blossom in the lower left of the image. There is some image shift in the captures as I had to press buttons on the back of the camera to change magnifications on the display, and the camera position shifted slightly for each image since it was on a bean bag close to the ground. While a more stable tripod is preferred, this setup was adequate since the alignment function in Photoshop corrects the slight image shift. The five captures were selected in Lightroom, exported to Photoshop as layers in a single image, auto-aligned and auto-blended. The final image was cropped to eliminate dead space to the right of the flower. A second set of captures was made with the camera/lens at its greatest magnification (closest focus). I took seven images from front to back at f/8 at 1/25th second exposure. The seven captures were selected in Lightroom, exported to Photoshop as layers in a single image, auto-aligned and auto-blended, and then cropped slightly to trim the edges. The resulting image looked good at first glance, but some areas of the image looked odd. The edges of some of the blossoms in the front of the plant appear to have halos and this occurs when there is another orchid or stem behind it. The stem is in focus except in areas near the edge of a blossom. There are no less than 16 areas in this image that exhibit this effect. Is it a shortfall of the Photoshop auto-blend algorithms? I decided to process the same captures with the Helicon Focus software which is designed specifically for focus stacking, taking advantage of their 30-day free trial. The resulting stacked image, using the same captures as the previous image, was initially disappointing since the software was specifically for merging focus slices. The two images below are an enlargement of the Photoshop auto-blend (left) and the Helicon Focus (right) processed images. On the left image, all three circles identify an out-of-focus band around the orchid. In the right image, the red area is much the same in both images. The blue area is handled better in Helicon Focus; there is still an out-of-focus band, but it is smaller. In the green area, it was not better, just different, having a different type of haloing in the Helicon Focus image. However, the structure of the blossom parts were much better handled in Helicon Focus, and obvious errors in the Photoshop merged image are identified by black circles. For convenience, a side-by-side collage of the two images is provided below. There was another anomaly in the Helicon Focus composite image; it did not handle the out-of-focus background very well. After seeing this, I went back to the original captures and saw that the background of the flower did change brightness from image to image. The light on the flower was stable as it was lit with an LED lamp; however, the background (forest floor) was naturally lit and no measures were taken to control that illumination. The passing clouds varied the light on the background during the capture of the seven focus slices. Helicon Focus does not seem to handle that situation well. To be honest, at the time I did not study the capabilities or adjustments available in Helicon Focus. There may be some way to adjust for the proper merger of this type, it’s just not obvious. Photoshop on the other hand did a great job of merging the various background tones. Closer inspection of the images processed with Photoshop show the same phenomena, a halo effect on the edges of a sharp foreground subject when it is overlapping a sharp background object. At first I thought I must be doing something incorrectly so I looked closely at the image files provided as a sample in the Helicon Focus. The same phenomena appear in this composite image, and it doesn’t change when the 25 captures are processed using the Photoshop technique. Without doubt I consider focus stacking to be a valuable technique and set out to better understand the process, when it works best, and when it works poorly. I continued to capture image sets for focus stacking with the goal of better understanding the limitations of the technique and the software. In Part 3, I’ll present some examples comparing the performance of Helicon Focus and the Photoshop auto-align,/auto-blend, and the results of some experiments to explain the halo phenomemon. Ever notice how little is in focus when taking close-up images, even with the lens set at f/22? At the closest focus distance of a 100mm macro lens of 12 inches, the depth of field is only .33 inches at f/22 with a full-frame sensor, and only .21 inches with a cropped sensor body. Well, there’s nothing to be done about the laws of physics, but there is a technique that can be used to increase the range of focus in digital images. Focus stacking is the merging of the sharp sections of multiple image captures of the same scene. I became interested in this technique as an avenue to increase the depth of sharpness in my macro images, but it can also be useful in landscape images when circumstances require. What I most desire from this technique is the ability to have a subject sharp from front to back while maintaining a pleasing out-of-focus background. I started my experimentation by capturing a series of images of an orchid on a recent trip to Costa Rica. At f/22, the range of focus did not capture the right and left orchid sepals in focus, and even if it did, such a small aperture resulted in more detail in the background than I wanted as seen in the first image below. I captured six images at f/13 with the intent of getting all parts of the orchid in focus, while rendering the background as softly out of focus as possible. I used a stacking technique in Photoshop CS5 to align and merge the images together. The second mage below is the composite image and even in this small sized image the complete focus of the flower and the more pleasing background blur are obvious. This process is not a magic panacea for increasing depth of field. As this was my first time using this technique, I had several surprises; the composite orchid image was surprisingly well assembled, pulling together all the sharp elements of the image. However, there were some anomalies that required further editing to clean up the image, more about that later. Overall I was pleased with the result and throughout the summer I used the technique when the opportunity presented itself. My goal was to photograph a Rattlesnake Orchid that has been growing along the edge of the wooded section of my yard since 2005, and it has blossomed only twice; in 2008 and again this year. The blossom is a stem of many tiny orchids that grow in a spiral around the stem. I wanted to document this beautiful flower as well as the stages of growth, if I could. One situation that focus staking serves as a useful tool it photographing a cluster or group of small subjects such as a cluster of mushrooms growing on the side of an old moss covered wood pile. The mushrooms I found have a deep ridged structure to the underside of the cap, and I wanted to capture this detail in a cluster of mushrooms. The span from the front edge of the mushrooms to the back edge of the most distant mushroom were about one inch. The first image is a single capture taken at f/22 and the second image is the composite image using 12 captures each at f/14 at 1/20 second and were aligned and merged using the Photoshop technique. The images were captured with a Canon 7D and Sigma 150mm f/2.8 macro lens mounted to a sturdy tripod. The starting point for capturing was determined by observation; I looked at the cluster of mushrooms from an angle that I could determine the edge closest to the camera, as well as the edge farthest from the camera. To ensure accurate focus, and to accurately judge that the next section of the flower to be in focus overlapped the previous section, I used the Live View feature of the camera. Instead of viewing the image through the viewfinder to compose and focus, live view lifts the mirror in the camera and displays what the sensor will capture in the display on the back of the camera. It also has a feature to enlarge a small portion of the image, allowing critical focus. When using a small aperture such as f/22, even a distant background shows some definition. In this example, while f22 captures the spider with adequate depth of field (DOF = .43 inch in this case), it results in too much detail in the background. As can be seen in this side view of an arrowhead micrathena, the distance from the top of the spinerets to the “arrow tips” of the abdomen is about 3/16 inch. To complicate matters, the spider was hanging from the center of the web. 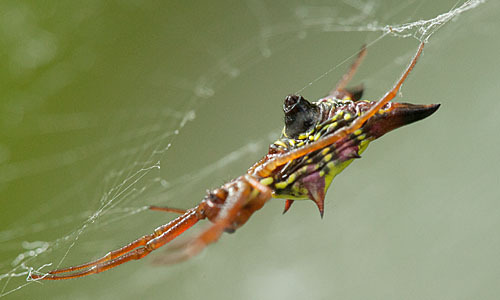 To isolate the spider and web from the background, focus stacking provides enough depth of field by blending several layers captured of the subject without extending significant depth of field to the background. The first image below is a single capture of f/22 and the second image is a composite of four captures at f8. For the spider image, the web was also moving slightly in the breeze. Photoshop’s auto-align handled the slight offsets in position for each capture very well, and no artifacts from the process were evident. Another good use of the focus stacking technique is the case where the subject is essentially flat, but the camera cannot be positioned so that the sensor plane is parallel to the subject. 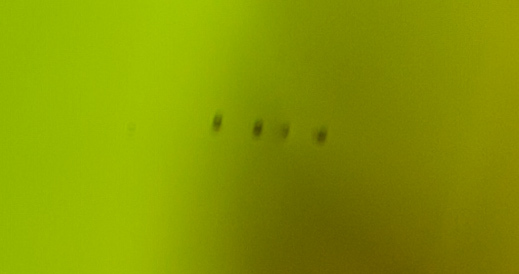 For this example I photographed water droplets on a window pane that formed due to condensation. A similar situation would be frost on the window in winter. I set the camera at an angle of about 15º in order to create the misalignment. The first image is a single capture at f/22. There is evident lack of sharpness on both sides. The second image is the last slice of 8 captures at f/8 with the right edge of the image in focus and the left side significantly out-of-focus. The thrid image is the 8 slice composite image and is sharp from edge to edge. Focus staking has been demonstrated to be a useful tool to increase depth of field in these situations. There are anomalies that sometimes arise; some of which are easily fixed and others that are impossible to fix. In Part 2, I’ll present some of the image processing errors I discovered, and describe some methods to edit the final images. I’ll also describe my tests of the Helicon Focus software, a product specifically designed for focus stacking. 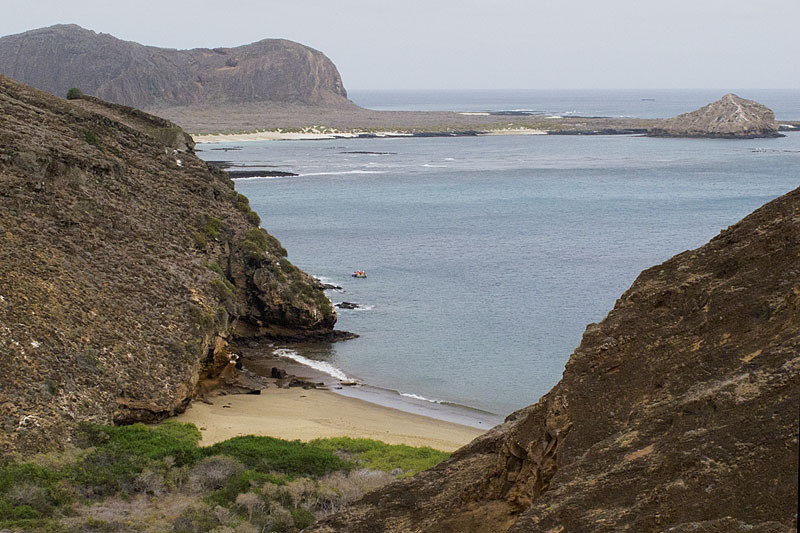 This was my second visit to the Galapagos Islands. My wife and I visited in April of 2005, and I never figured I’d return since I have a lot of other locations on my list of places to visit and photograph. This trip was one of the prizes awarded to me as grand prize winner in the 2010 Audubon Magazine photography contest. 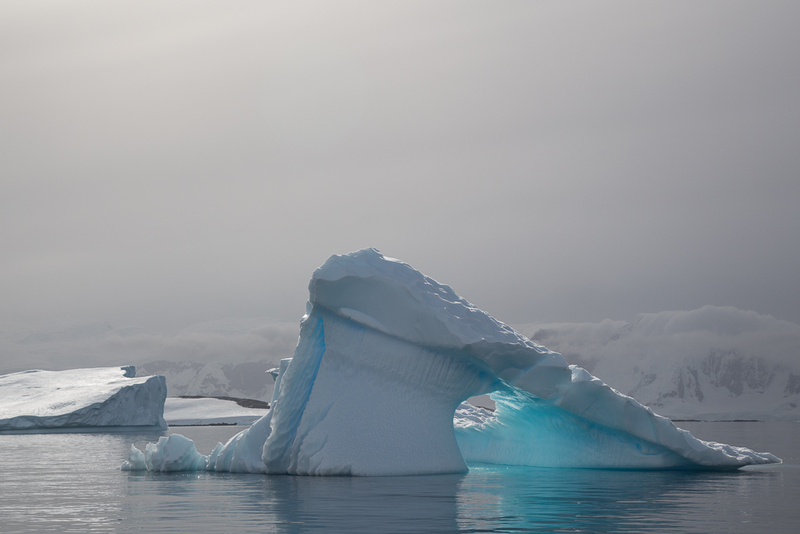 The cruise was provided by Lindblad Expeditions aboard the National Geographic Endeavor. Lindblad and Nat Geo do organize a great trip, with top notch naturalists, including a few trained by National Geographic photographers to provide advice and guidance to the less experienced photographers among the passengers. Each day was similar in schedule, but widely different in experience. We’d awake anchored in the location for the morning excursion. Occasionally a choice of activities was offered which might include a long walk, a short walk, or just a stay on the beach but mostly one walk was offered. There was always an alternative activity, usually a zodiac ride along the coast, for those not wishing to take the offered hike. Most landings (all but two) were wet landings; the zodiac would get close to the beach, and the passengers in turn would get off into the water and wade to the beach. The water was never more than knee deep, and towels were provided on the beach to dry off feet and put on shoes for the walk. Upon embarking the ship from the morning excursion, we’d sail during lunch to a second location for the afternoon activity. Between shore excursions were afternoon lectures, occasional deep water snorkeling or kayaking opportunities. The weather was mild and cloud covered for sunrise, with the clouds burning off as the day went on, with the afternoons mostly sunny. Seas were mostly calm even when on the edge of the archipelago north of Isabella Island. Sunrise photography was not great, and only one evening was good for sunset, with the exception of the last evening at sea, when we were circumnavigating Kicker Rock, unique rock formations which are the remnants of a volcanic cone. 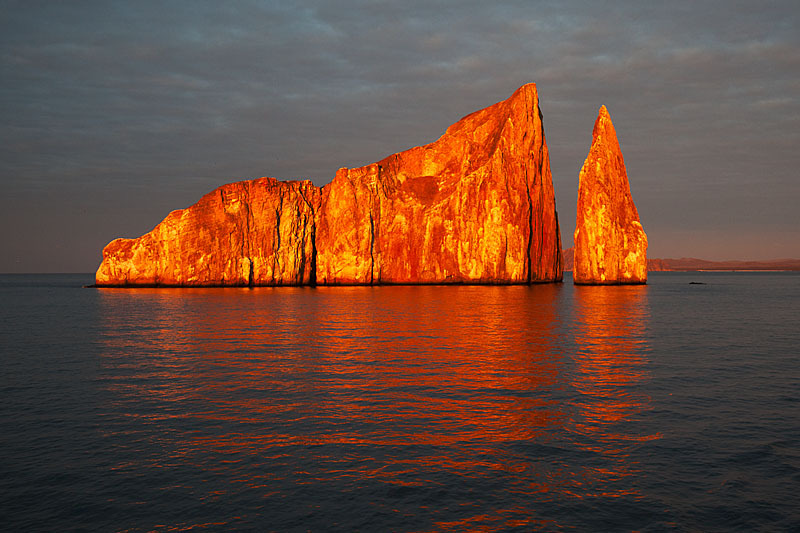 Just before we sailed away from this rock, the light turned golden and the rock appeared on fire. Based on the week of dull evening light, this last evening was spectacular. The ship was sailing into the sunset, I hurried to the bow of the ship, where both feet slipped out from under me, I landed flat on my face spread out on the deck, my camera skidded across the deck . . . and no one noticed. I dragged myself up and looked around; everyone was intently watching the sunset and hadn’t noticed my acrobatics at all. At the end of September, my wife, Chris, and I visited Yellowstone National Park and Grand Teton National Park hoping to see and photograph the yellow and orange fall foliage, abundant wildlife preparing for winter, and perhaps a touch of winter itself. We arrived with the leaves just starting to turn, scant wildlife, and temperatures in the 80’s for the first few days. We did find a herd of 200 or so bison spread out in the Lamar Valley and on the return to Mammoth Hot Springs we found a herd of ten pronghorn does with a buck keeping order. One evening we also had a few bighorn sheep come down the cliffs to the Gardiner River. The first evening we planned on eating at the park dining room anticipating the evening show; 30-40 elk cows with two or three bulls vying to keep track of their respective harems, and try to coax a few more cows from another harem. We saw one nice bull, and four cows. Where did they all go? The introduction of wolves to the park did reduce the elk herds, but to a greater degree than initially expected. This was a result of the overwhelming success of the wolf packs, which have done better than predicted. The wolf/elk ratio has probably hit an equilibrium; if there are not enough elk for one reason, let’s say a bad winter, there will be fewer surviving wolf pups due to less food available, then the elk with have greater success, and then the wolf numbers will increase. We spent the first three nights based in Gardiner, MT, at the north entrance to Yellowstone NP. From there it is convenient to travel to the Lamar Valley, Tower Junction and the Canyon Village section beyond, and to Norris Geyser basin. Basically, the northern half of the park. 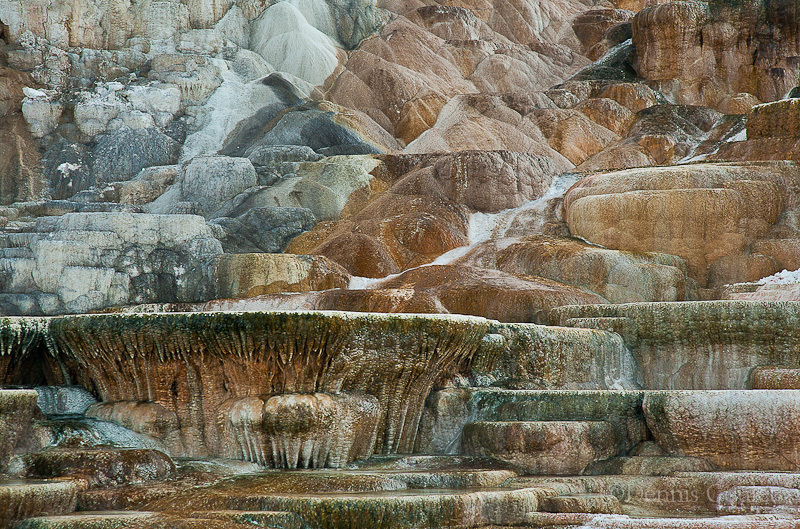 Mammoth Hot Springs is the northern headquarters of the park services with lodging, dining, and conveniences (general store, fuel, post office, etc.). The springs for which the area is named, and the travertine cliffs here have changed over the years as geologic activity redirects the hot spring water below ground though subterranean limestone, dissolving calcium carbonate and depositing it as travertine (a bone white mineral) as the water cools on the surface. But that is not what creates the rainbow of colors at this, and all other, thermal features: it’s the thermopiles (heat-loving microorganisms). The color of the thermopiles is due to the temperature of the water. Cooler waters support the growth of orange, brown and green thermopiles while clear and yellow thermopiles thrive in the hottest water. 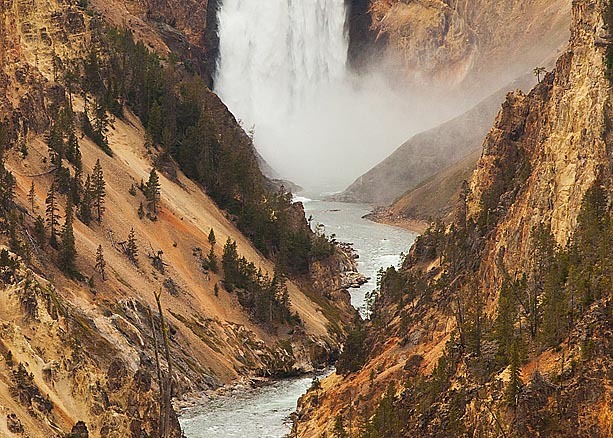 The Grand Canyon of the Yellowstone has several viewpoints to easily view and photograph both the upper and lower falls and the Yellowstone River. There are also a number of trails that lead down into the canyon for a more intimate view of the falls. We visited the canyon on different days and at different times of day to get a variety of light into the canyon. While overcast conditions greatly reduce shadows in the canyon, the light is not dramatic nor does it bring out the intense colors of the rock. The sun cast heavy shadow on half the canyon for our visit to the canyon at midday, and a return visit a few days later at 3pm with cumulous clouds in the sky provided a brightly lit inner canyon. Our next stop was in Jackson, WY, near Jackson Hole and the Grand Tetons National Park. Since we were so late in planning this trip,we opted to stay in Jackson, even though we would have an additional 20 minute drive into the park for sunrise. 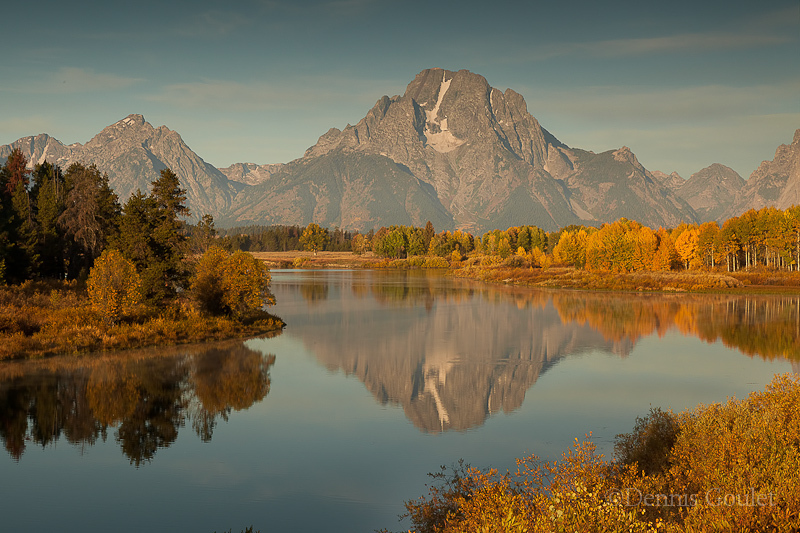 Sunrise opportunities are numerous in Grand Teton; Schwabacher Landing, Oxbow Bend, Molton Barn and Mormon Row. In our exploration we found a beaver pond near the road (about a foot away from the road) where one evening we watched two adult and two young beavers feeding on the bark and leaves of small branches within fifteen feet of us. We visited the location several times during our four days in Jackson and did repeat the experience. Again, wildlife was somewhat scarce, with the exception of the beaver. We saw several elk cows and a couple of bulls in the early evening hours, but did not see a single moose. We did see osprey on a nest but the position made photography impossible, and saw a red tail hawk flying. In any case, the landscape photography opportunities were reasonably decent, even though proscribe forest fires at the south end of the park resulted in ground smoke at the base of the mountains. This is evident in the images that show a grey pallor on the lower half of the mountains. We then moved on to Old Faithful Snow Lodge for the last five nights of our stay. This location gave us good access to the southern half of the park, and even drives to the Canyon Village area were not that far away. A large number of visitor accessible thermal features is in this area, including Old Faithful geyser. 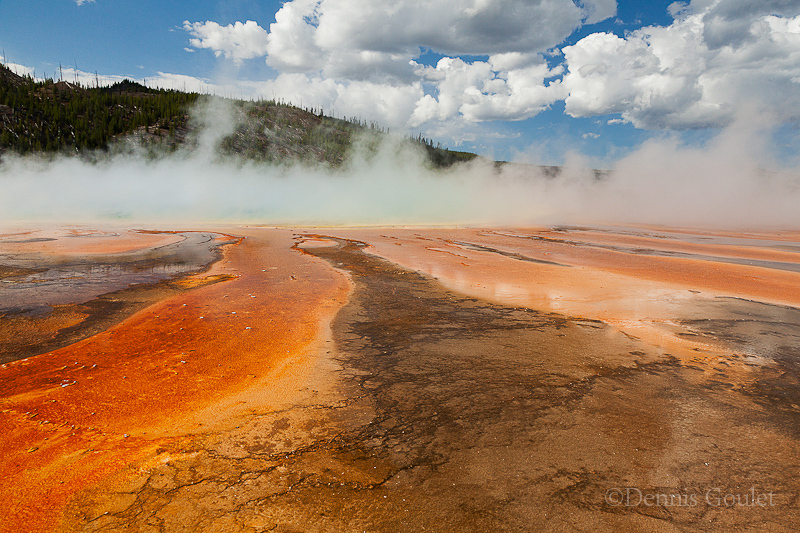 Photographing hot pools and geysers can be challenging as they produce large amounts of steam. Your luck will depend largely on the direction and speed of the wind, and the air temperature. On my winter visit here, there were times when you could hear a hot pool bubbling, but couldn’t see it for all the steam surrounding it. The higher daytime temperatures (low 70’s) while we were there offered up some interesting views of the thermal features. I concentrated on areas of the thermal features that had striking color or interesting compositions. The wildlife activity did eventually perk up as the nights became cooler and the daytime heat finally abated. We saw several herds of elk along the Madison River, and bison herds could be seen at many locations with about 50 animals each, except for the big herd in the Lamar Valley. By far the best experience was viewing a pack of wolves in the Lamar Valley returning to an elk they had killed the day earlier. At one of the pull-outs overlooking Hayden Valley we overheard this tidbit of information from a couple that was deciding where to go next. One at a time the wolves would come to the carcass, chase off the ravens and magpies and try to pry meat from the bone. Since the carcass was in the river, one wolf tried to pull it up onto the bank to get at the meat that was previously submerged. Another big spectacle was the number of photographers who had lined up shoulder to shoulder in two locations.